Faithful INKspirations: Where Does the Time Go? #stampinup Do you ever have days or weeks when the time just gets away from you? For some reason, I've been feeling that way a lot this year! It may be because I've changed my schedule and I'm getting up earlier so my son can practice driving to high school....and I'm NOT going to bed any earlier. You'd think I'd feel like I have more time, but it's not quite working out that way. My dad used to say that your expenses expand the more money you make...whenever I thought that if I just got a raise I could save some money. I think time must work that way too--I'm awake for a longer period of time, but I'm still filling almost every waking hour (well, sometimes I fill those "waking" hours with a nap or some mindless TV). Anyway, I meant to play along in last week's Create with Connie and Mary sketch challenge. I even made a card for it. But I didn't get it posted in time for the deadline. Whatever. It's still an awesome sketch and I really like how my card turned out. And I hope my blog followers will still be inspired by it!! It's an awesome sketch, too! I've mentioned before that I really love the Going Places suite in the Occasions catalog. I love the stamp set, the coordinating World Traveler Embossing Folder, and the papers in the Going Places 6" x 6" Designer Series Paper Stack. I thought this sketch would be a great way to showcase how perfectly everything goes together. I started by embossing a Delightful Dijon panel with the World Traveler Embossing Folder. 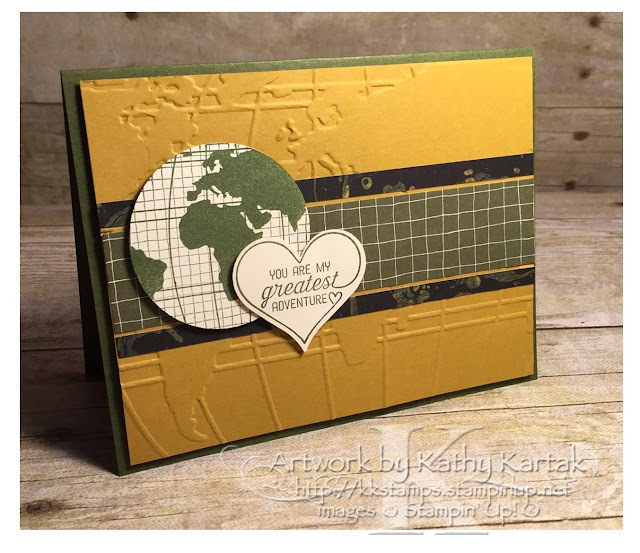 I used Stampin' Dimensionals to add this to a Mossy Meadow card base. Next, I added a 1.5" strip of Mossy Meadow grid paper from the Going Places DSP stack, set off by two 1/4" strips from the same DSP stack. I used snail adhesive for the 1/4" strips. I laid them on a scrap of card stock, ran the snail along their length and peeled them off and applied them to the card like stickers. Finally, I stamped the globe and "you are my greatest adventure" heart in Mossy Meadow onto Very Vanilla. I punched the globe with the 2" Circle Punch and the heart with the Sweetheart Punch. I adhered these elements to the card with Stampin' Dimensionals. I really like how this simple card turned out--the layout is wonderful and I love the textures from the embossing and the DSP!